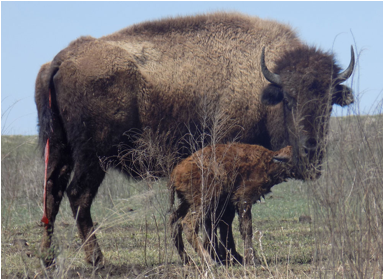 Along with his daughter and four grandchildren, George Perdue of Texas witnessed a once-in-a-lifetime experience at Joseph H. Williams Tallgrass Prairie Preserve in Pawhuska on Easter Sunday: the first baby bison of 2016 alongside its mother just after birth! As a member of The Nature Conservancy for 45 years, this was George’s first visit to the preserve. “On our way out of the preserve, we saw this newborn and mother. Birth was just minutes before we got there. It was the highlight of a very nice trip,” Perdue said. Coincidentally, the first bouncing baby bison of 2015 was also seen on Easter Sunday. In the spring of 2015, about 560 calves were born. Preserve staff expect another 600-700 this spring making now a great time to visit the preserve to view the precious bundles of joy along with the 2,100 adult bison that roam freely. Young bison are fun to watch as they can be rather playful. Visitors may see calves frolicking, chasing, battling, butting, kicking, and racing. Such activity aids muscle development and coordination important later in life. Rule #1: Stay in your car! Rule #2: Stay in your car! Rule #3: Stay in your car! Bison are fast – they can go from 0 to oops (up to 35mph) faster than you can say it! If they’re blocking the road, be patient. Though they may be big and fuzzy, bison are wild animals and are not cuddly. The preserve is open daily from dawn to dusk with no charge for admittance and can be accessed via county roads. There are free ranging bison herds, scenic turnouts, hiking trails, picnic tables, breezeway information and public restrooms at the Historic Bunkhouse. The gift shop / visitor center is open from March through mid-December from 10:00am to 4:00pm. It is operated by docents, and is typically open every day. Consisting of almost 40,000 acres near Pawhuska in Osage County, the Tallgrass Prairie Preserve is the largest protected remnant of tallgrass prairie left in the world! Since 1993, The Nature Conservancy of Oklahoma has proven successful at restoring this fully-functioning portion of the tallgrass prairie ecosystem with the use of free-roaming bison. The herd started with 300 bison in 1993 and continues to thrive despite the recent drought. Learn more by visiting nature.org/tallgrass. Directions to the preserve: From downtown Pawhuska, drive north on Kihekah at the intersection of Highway 60 (at the corner of the triangle-shaped building), follow signs to the preserve headquarters (approximately 18 miles). Though “buffalo” is commonly used, “bison” is the correct term for the mammals on the Tallgrass Prairie Preserve. According to scientists, true buffalo are confined to Africa and Southeast Asia. Before the settlements of modern civilization, around 30 million bison roamed across North America. By 1890, fewer than 600 plains bison were left alive. Bison are the largest native animals on the North American continent. Full-grown bison bulls stand about 6.5 feet at the shoulder and can weigh up to 2,000 pounds. Adult bison consume more than 30 pounds of grass (air-dry weight) in a day. Bison can run at speeds up to 35 miles per hour. Bison are powerful swimmers, navigating with all but hump, muzzle, and top of the head submerged. Both sexes have horns; the cow’s are smaller. A bull bison can be identified from a cow by wider, thicker horns; a wider skull; and a generally more massive structure. The gestation period for bison is 9.5 months. Bison calves are generally born in the spring and weigh 30-40 pounds. The bison was named the state mammal of Oklahoma by the legislature in 1972.